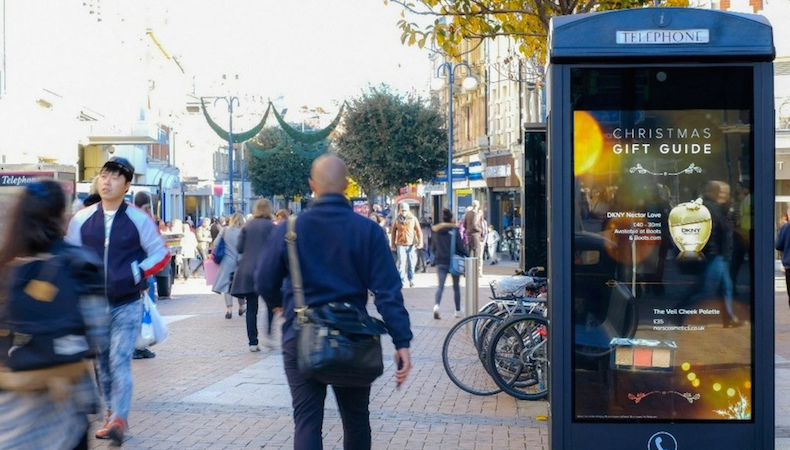 Clear Channel has unveiled the first digital out of home (DOOH) Christmas Gift Guide, featuring gift ideas from a range of brands to inspire shoppers in the run-up to the festive season. The campaign showcases products from six advertisers including Coty, Estee Lauder, NARS, Philips, Very and ViFit, and is currently running nationwide across 900 screens from Adshel Live’s digital street furniture network located in premium locations targeting shoppers on busy high streets and roadsides. The campaign, which is the first of its kind, was inspired by traditional printed Christmas gift guides and the concept has been adapted to use DOOH’s creativity and flexibility. Each 10-second spot includes all six brands in creative reminiscent of the traditional gift guide layout and features subtle animation to drive cut-through and engage consumers. The campaign will be live during shopping hours and will be played out two million times during its two-week run, reaching an estimated audience of 6.2 million people. Commenting on this innovation Clear Channel Commercial Director Chris Pelekanou said: “The beauty of DOOH is both its flexibility and creative capabilities. The DOOH Christmas Gift Guide is a unique and creative solution that enables advertisers to promote their brands in the run-up to Christmas." Commenting on the campaign, Vizeum Communications Planning Manager Courtney Stewart, said: “The Clear Channel team came to us with a creative concept that would allow us to reach and target Christmas shoppers while they are in the shopping mindset."